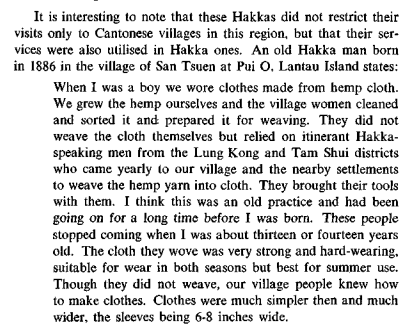 James Hayes has kindly given permission to post his 1968 RASHKB article about the weaving of locally grown hemp thread into cloth during the annual visits of mostly male Hakka weavers. 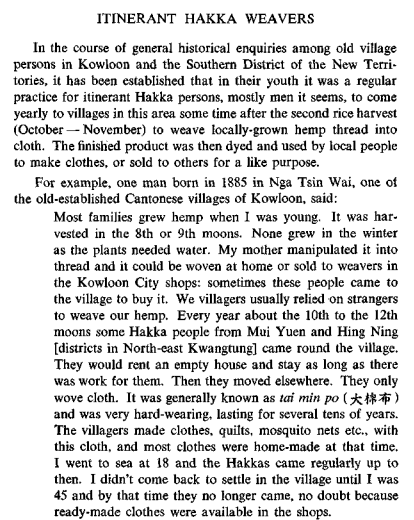 This was then used to make clothes, quilts, mosquito nets and other items of use in the New Territories in the 19th century. The practice appears to have ended in the early years of the 20th when it became cheaper to buy cloth. The image shown on the Home page of this article does not come from James’ article. It shows a group of Hakka ladies, location and date unknown.